After nearly five years of cloth diapering (really? yes, nearly!! )… I reflect on whether the cloth diaper industry can surprise us anymore. Other than with awesome new fashion prints! I thought I’d seen the last of the innovations, truly, I did. And then? FuzziBunz contacted me asking if I’d share the NEW FuzziBunz One-Size diapers with you. Which. Of course! I love cloth diapers!! So I agreed to add this latest version to my roster of FuzziBunz reviews. I didn’t know what to expect from these new FuzziBunz diapers. But as I read the literature and checked out these diapers myself, I’m impressed with what they’ve accomplished. First. Let me say, these are not the FuzziBunz Elites we all knew from years past. Yes, you’ll see a similar button + elastic adjustability that is the hallmark of FuzziBunz design. But these diapers have been completely re-engineered by a grandfather of nine. Okay, if that isn’t impressive, let me tell you that the designer, Roy Couvillion, has previous experience in structural engineering of everything from helicopters to surgical devices. 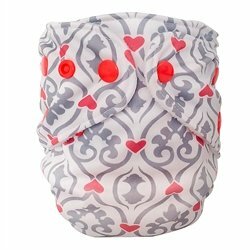 If you’ve been a cloth diapering mom for long, you know you pretty much need that kind of range! LOL. What’s new and different about these FuzziBunz? Let me drop a bombshell on you: These one-size diapers come in TWO sizes. Wait a second, what? Yep. At first I was thinking, “did they not understand the term One-size! ?” When it comes to the new FuzziBunz, these diaper ARE One-Size. But in two “versions” called Small and Large. Let me explain. The Small One-Size fits babies from 7-30 pounds. This is typical of most babies birth to potty training. And it would’ve been awesome for my first son as he barely cracked the 30 pound mark by the time he potty trained. 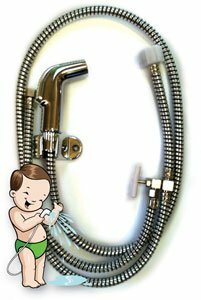 The Large One-Size fits babies from about 10-45 pounds. YES! Quite the range, right? This diaper size is perfect for my second son, as he moved quickly past his birth weight of 7+ pounds and hit 20 pounds before his first birthday! He’s now two years old and sitting right at the 30 pound mark, and we’re probably nearly a year away from potty training. So… this version of the FuzziBunz diaper will see us through his next year of transition. So… are you seeing it now? Each FuzziBunz version CAN take a child from birth-to-potty. But babies are born at all different weights and body shapes. I had both a slim baby and a chunky baby, so I see how the different diaper sizes would suit different babies. The new FuzziBunz gives parents the option to pick the One-size version that best matches their baby’s body type. How did it perform on my baby? I was sent both a large and a small One-size FuzziBunz diaper (the yellow diaper). At first, looking at the small (which goes up to 30 pounds), I thought, “no way will this go on my 30 lb boy because he’s got such chunky thighs.” But… I tried it on for the photos and lo and behold, although he’s at the max weight for this diaper, it fits him really well! Of course, he’ll outgrow it soon, making the Large version (the green diaper) a better choice for him, but just to show that even the “small” One-Size does the job! The Large One-Size also fits him fine right now, but you can probably note in the photo how there’s more fullness in that diaper, giving him room to grow! Now… I call that a fascinating innovation in cloth diapering, don’t you? But wait – there’s more! Yep! Improved closure system – with custom woven reinforcement and improved snap placement, the fit is more cumberbund-like than tight. I also can appreciate that FINALLY I can get a smooth finish to snapping this diaper on – something I generally didn’t get in the old versions. Phew! That’s a lot for a cloth diaper, don’t you think? 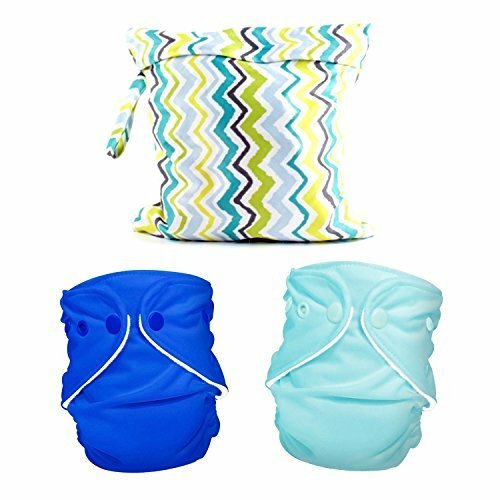 But… today’s cloth diapering mamas know a cloth diaper needs to be performance gear! You don’t spend the money on a cloth diaper to have it fail under pressure (or because your baby has a growth spurt at nine months!). I think the new FuzziBunz One-size cloth diapers are just what many moms are looking for in a cloth diaper, and I am thrilled to have tried them out to share with you! Psst – if you’re a die-hard fan of the FuzziBunz Perfect Fit, you’ll be happy to note they are still available! Oh and… because I don’t have a little squishy newbie of my own, FuzziBunz sent me this adorable picture of a new FuzziBunz on a wee one. See how cute? 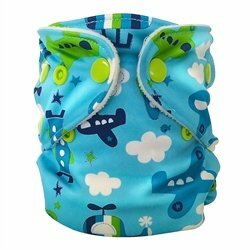 What do you think of the innovations in the NEW FuzziBunz cloth diaper? What’s your favorite new feature? I answer your questions about using cloth for potty training with FuzziBunz Cloth Training Pants and other options! 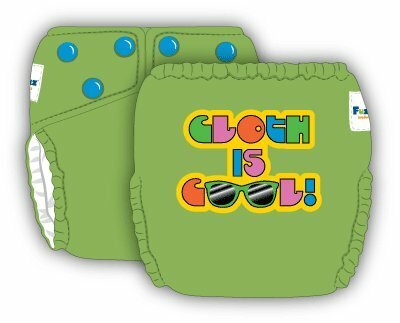 Shop for the latest in cloth diapering! The latest cloth diaper prints, accessories, and prints from FuzziBunz! Disclosure: I was provided products to use for my review, however, all opinions are 100% my own. We are a participant in the Amazon Services LLC Associates Program, an affiliate advertising program designed to provide a means for us to earn fees by linking to Amazon.com and affiliated sites. Wow! They really did re-do everything. I wonder what the founder thinks. I still have and use my original FB and I also have the original one size. I remember when those were the new big thing. Sadly, with all the health issues our baby has had, we have been doing a little break from cloth. I am hoping in a week or so we can go back to CDing. We really miss it. Yes, from the die hard nothing but cloth mama. It was bad but we’ll be back at it. And great review, by the way. I’ve missed reading your reviews and you’ve really come a long way from 4 years ago.